The item is a photograph postcard showing Saint-George Catholic Church, convent and presbytery in Clarenceville from about 1909. The item is a postcard of three women standing front of a house and verandah in Clarenceville from about 1908. The item is a postcard of a house in Clarenceville from 1909. The item is a photograph postcard of the Anglican and Methodist Churches in Clarenceville from around 1910. The item is a postcard of the Saint-George Catholic church and rectory in Clarenceville from 1909. The item is a photograph postcard looking north on Front Street in Clarenceville from 1908. The item is a photograph postcard showing the Derick general store, with views of Main Street and Front Street South in Clarenceville from around 1910. 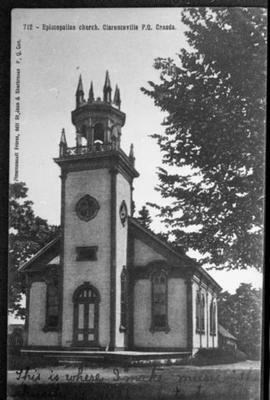 The item is a postcard of the St. George's Anglican Church in Clarenceville from 1908. The item is a postcard showing the interior of the Clarenceville Methodist Church, later United, from around 1907. Front Street North, Clarenceville, Que. The item is a photograph postcard of Front Street North in Clarenceville, including a few of a side of the Clarenceville Methodist (United) Church, from around the 1910s. The item is a photograph postcard with a view of the Methodist (United) and Anglican churches in Clarenceville from 1909. The item is a postcard of the interior of the Saint George Anglican Church from around the 1930s. Derick Store, Empire Hall, Methodist Church, Clarenceville, P.Q. The item is a photograph postcard of the Derick general store, United Church and Empire Hall in Clarenceville from about 1910. Interior of the Church, Clarenceville, P.Q. The item is a photograph postcard showing the interior of the Saint-George Catholic Church in Clarenceville from about 1906. 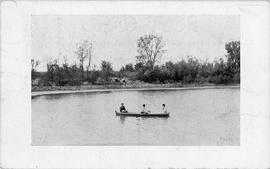 The item is a postcard of the Clarenceville United Church, originally of Methodist denomination, from around the 1920s. St. George's Church, Clarenceville, Que. The item is a postcard with a view St. George's Anglican Church in Clarenceville from around 1906. The item is a photograph postcard of school children in front of Clarenceville Academy, also known as the Model School, during winter from 1909. The item is a postcard showing Empire Hall and South Street in Clarenceville from 1907.